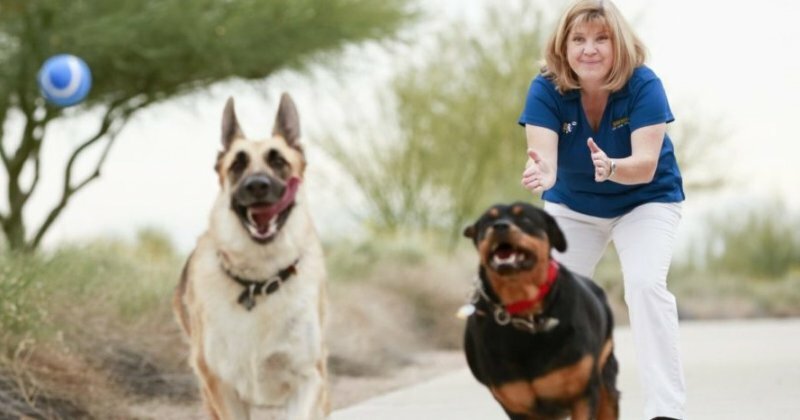 Best Dog Training in Greater Phoenix, AZ! My name is Michelle Willey and I am a Master Trainer with Bark Busters Phoenix. Dog training is my passion and there are so many aspects to my job that I enjoy: helping people, meeting wonderful dogs, but mostly I love opening an owner’s eyes to their dog’s true potential. Most people really love their dog but have a few behaviors that are bothering them or want to prevent bad behaviors in a new dog that they may have “lived with” from a previous dog. Overcoming behavioral issues happens quickly with my all-natural training methods. All the training happens in your home where you and your dog are most comfortable. The training is personalized to you and for your dog. I am working together with you, guiding you to find the leadership and relationship with your dog that you desire. The bond you will create is sealed in loyalty, respect, and trust. I never employ harsh methods like shock collars or prong collars. I don’t use tools like treats and clickers. My natural methods rely on voice and body language to help your dog to understand you in the way nature intended. As your Phoenix dog trainer, I want my clients to understand that the gift of leadership is what their dog has always needed from them. When this goal is accomplished it makes for a balanced and well-adjusted dog that is void of many of the negative behavioral issues owners experience. Most clients see results literally in the first training session. I give instructions, feedback, homework, and plans for returning if needed. I believe getting your dog on track is a team event and it requires effort from both myself and the dog owner. Many clients have come to me after other types of training methods have failed. Don’t give up on your dog without working with me first. Bark Busters Phoenix Goodyear has saved many dogs that would have gone to shelters, been rehomed, or been euthanized because of behavioral issues. Your dog would dial the phone if he could! At Bark Busters Phoenix, I come when called! I routinely speak at Vet Offices, Children or Adult Schools, Animal Shelters, Town or City Meetings, and various other forums on such topics as General Dog Behavior, Aggression, Dog Safety in the Workplace, Puppy Behavior, Adoption, or any dog related topic of your choice. Call me at (877) 500-2275 for more information. Share Your Experience with Bark Busters! Amazing! Michelle is seriously a miracle worker. We were absolutely stunned at how simply and quickly she got our 2 puppies to pay attention and correct their behaviors. I cannot speak highly enough to this training method and to Michelle as an instructor!